We welcome you from 9 am (last departure 15:00). The registration and transfer to your departure point are from the Aubanel base. You are free to enjoy the descent at your own pace without rushing to meet a prearranged transfer back to your car, as the descents finish where you parked your car. In our view, this site is magical and we welcome you to experience it with us. 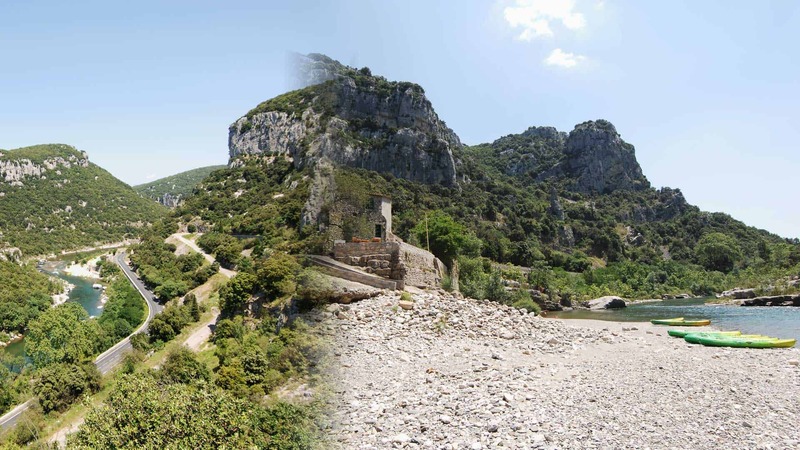 You will be welcomed at the Aubanel base where you will find friendliness, parking, refreshments, toilets, showers and the transfer which will take you to your departure point for your descent in the Herault gorges. The main base can be found on the Hérault river, between Montpellier and Ganges, just outside St-Bauzille-de-Putois, the village where you can find the famous Grotte des Demoiselles. It is the departure point for the 9 km family descent and the arrival of the 3 km descent. This stone building, is nestled above a lovely pebbled river bank, from where you can discover the gorges. We sell drinks and ice creams which can be enjoyed on our overhanging terrace. This base is found 4 km further up the road in the direction of Ganges, just beyond the village of Laroque… If you arrive from Ganges you will find us just on the entrance to the village on the right, this is where the 3 km and 12 km descents start. The nautical base of Laroque is our new spot. It can offers rental equipment for our nautical activities. Please note that this place only provide you an access to enjoy the water. it’s not a departure or an arrival for our nautic activities. More information here.